A few weeks ago I made a very simple Tatin cheat using store-bought puff pastry but without turning the tart. Many recipes for Tarte Tatin use store-bought puff pastry, but I’m quite sure that the Tatin sisters used more simple pastry so instead I made pastry dough from scratch. Here’s my version. 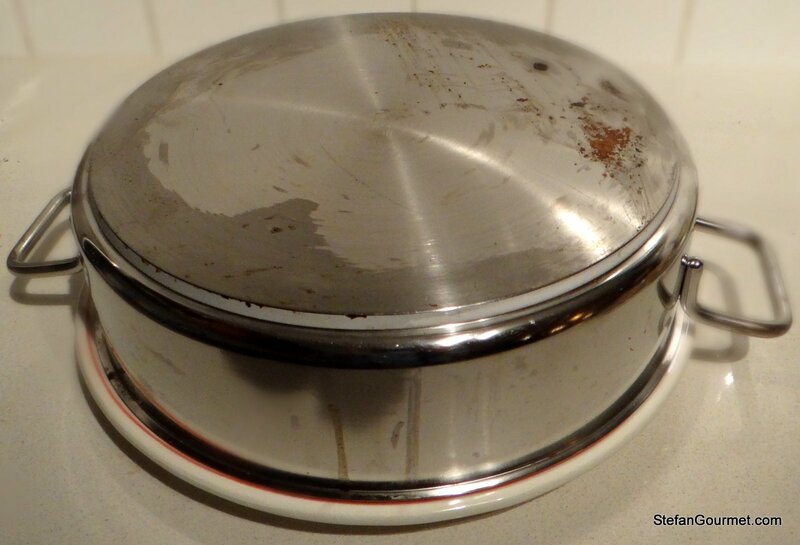 You will need an oven-proof flat pan with a diameter of 28 cm (11″). 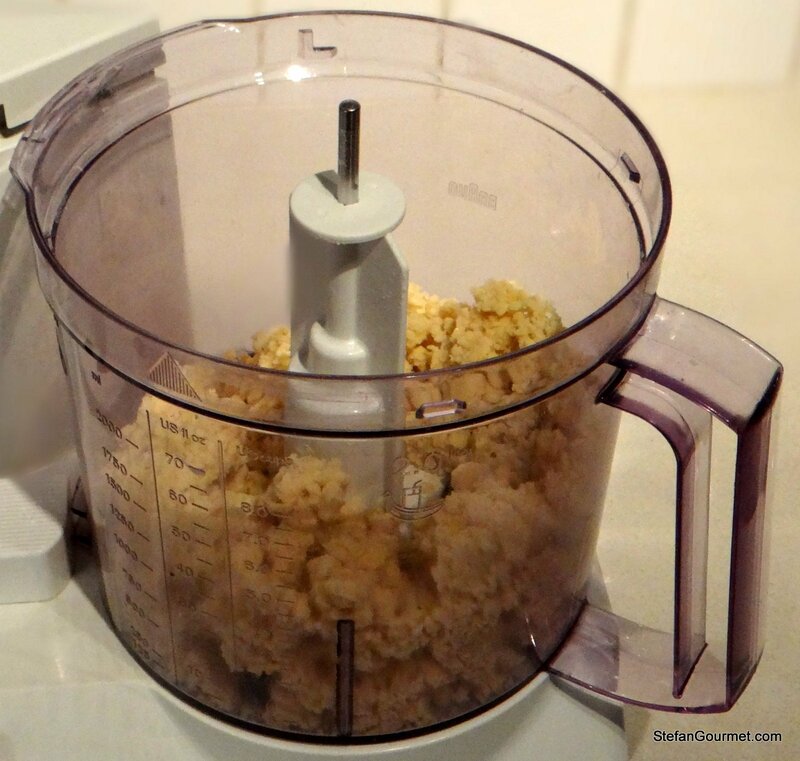 Put the pastry flour, salt and sugar in the bowl of a food processor, preferably with the pastry attachment but the metal blade should also do the trick. 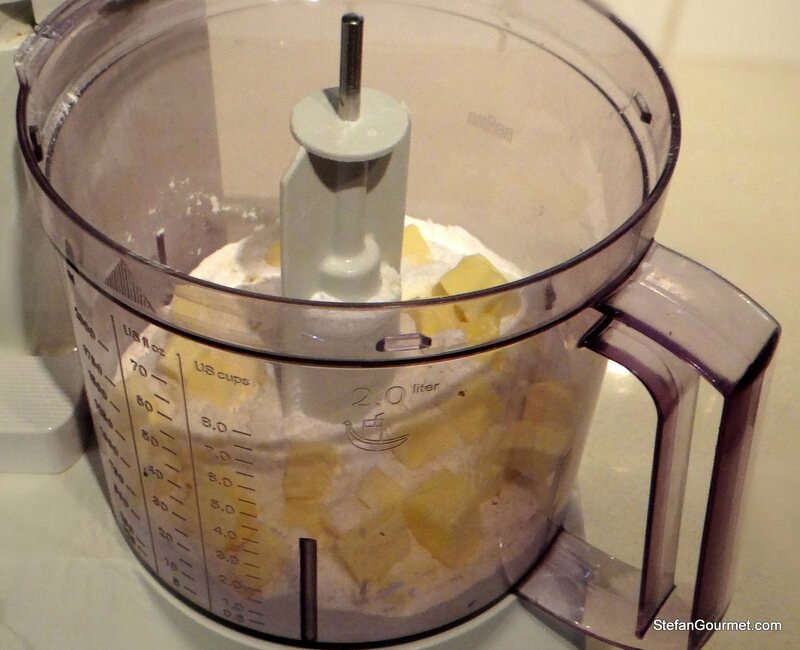 Add the cold butter in cubes. Process until you obtain a mixture that looks like sand. 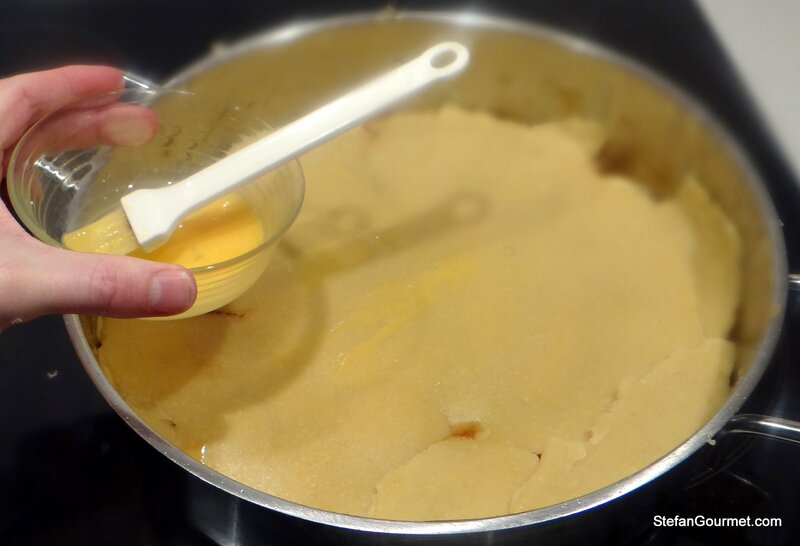 Add most of the beaten egg, saving just a tablespoon or so for brushing the pastry later. Process until the dough starts to come together. 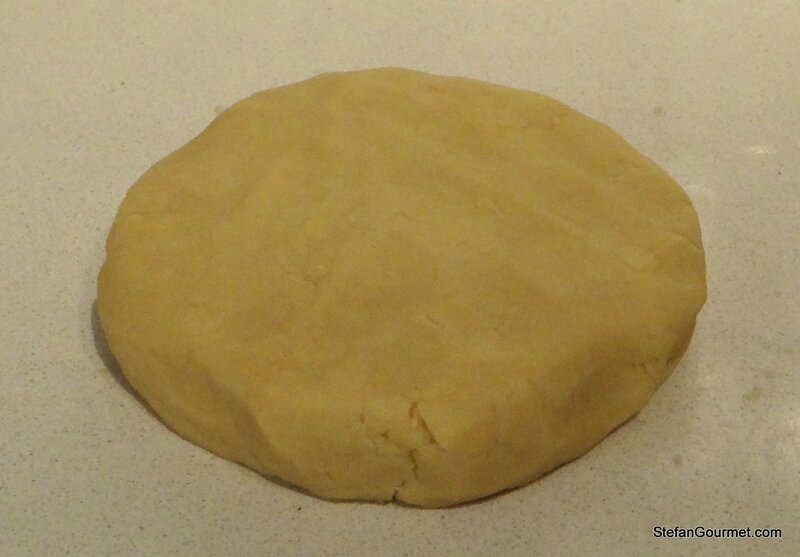 Shape the dough into a thick round disc with your hands. Wrap it in plastic wrap and refrigerate for half an hour so. 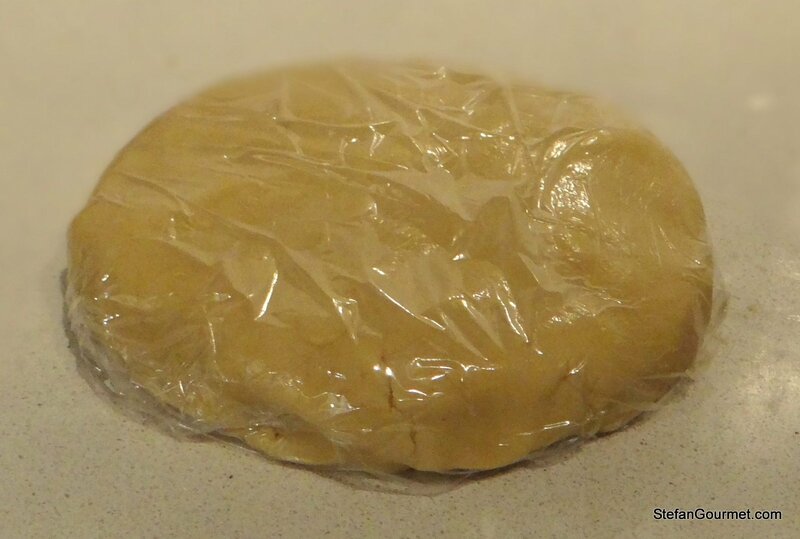 If you refrigerate it too long, it will be difficult to roll out the dough. Without refrigeration, the dough will fall apart when you try to lift it. 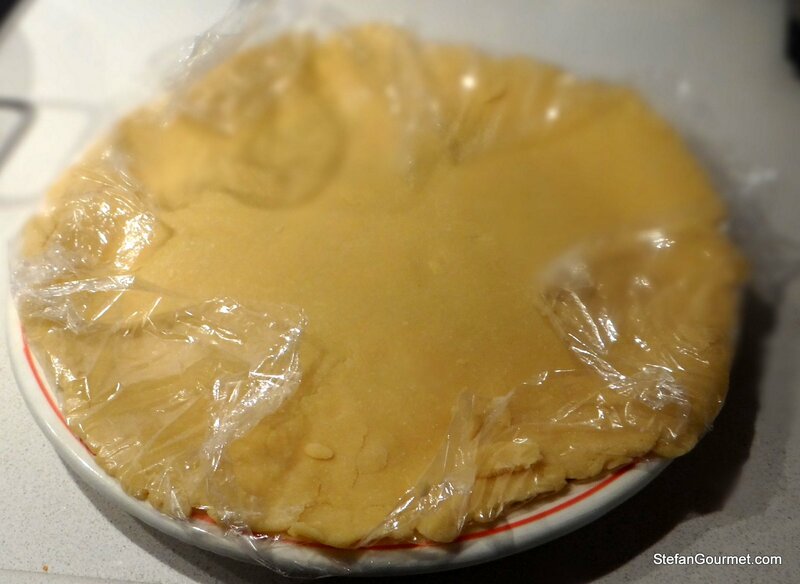 After half an hour, take the dough out of the refrigerator and out of the plastic wrap. Roll it out with a rolling pin on a floured work surface. 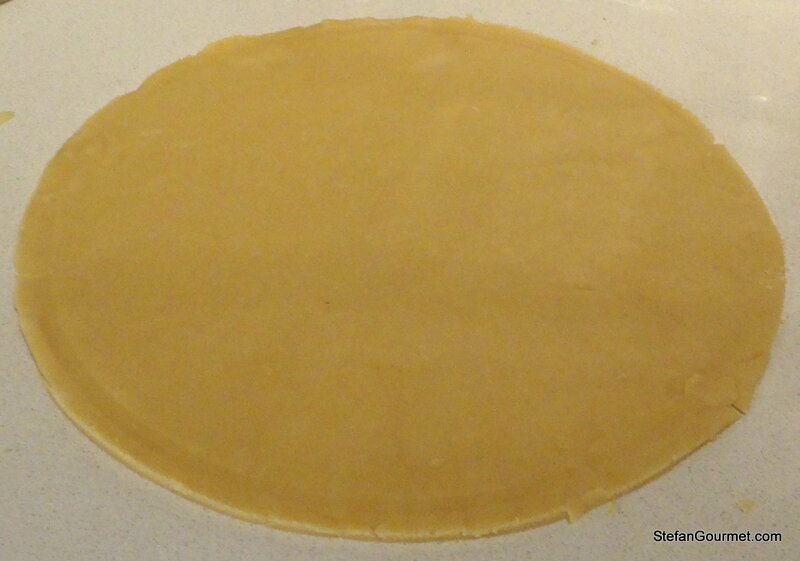 Use the pan (or the cover of the pan) to measure the size of the dough. Create a circle of 28 cm in diameter (11″). 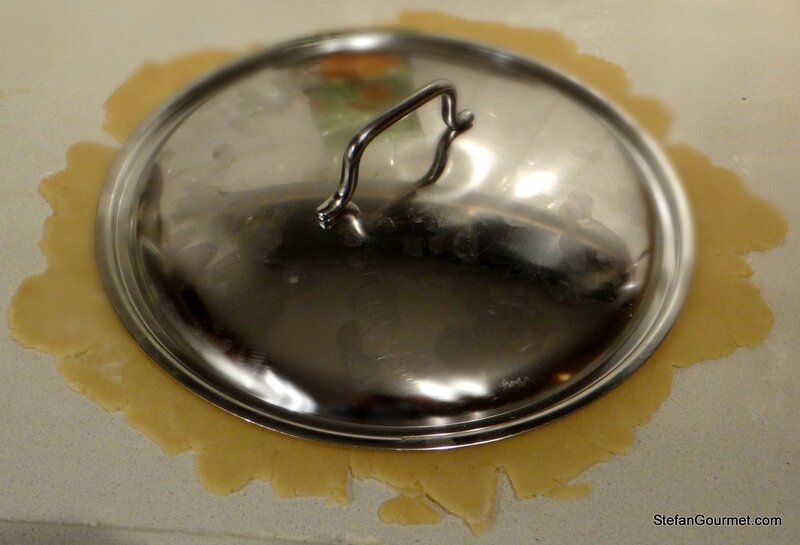 Wrap the circle in plastic foil, put it on a large plate, and refrigerate for at least an hour. Preheat the oven to 200C/390F. Peel and core the apples and cut each apple into 16 wedges. 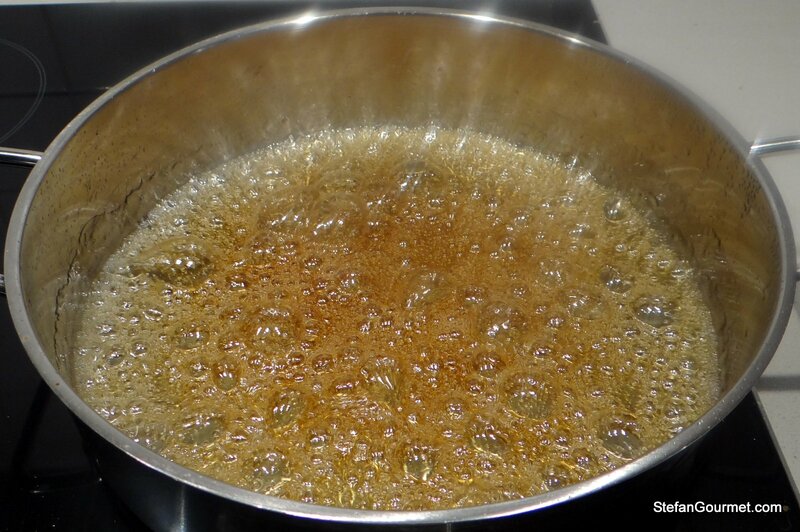 Combine the sugar and water for the caramel in the 28 cm (11″) pan and heat over high heat. 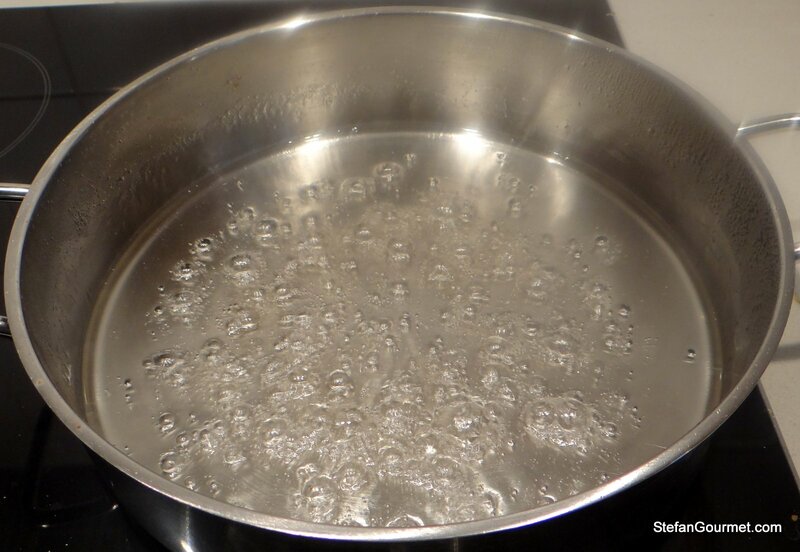 Continue to heat, without stirring, until a caramel starts to form that has a nice amber color. If the caramel doesn’t form evenly, it is okay to tilt and swirl the caramel in the pan, but do not stir. 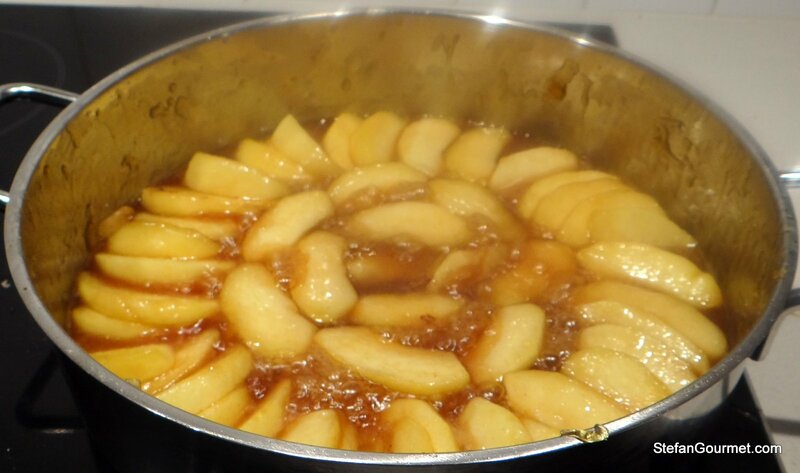 Add the apples before the caramel turns dark brown, and toss the apples in the caramel to coat them on all sides. Lower the heat to medium. Add the salted butter (or unsalted butter and a generous pinch of salt) and cinnamon and stir to incorporate. Arrange the apple slices in a nice pattern. 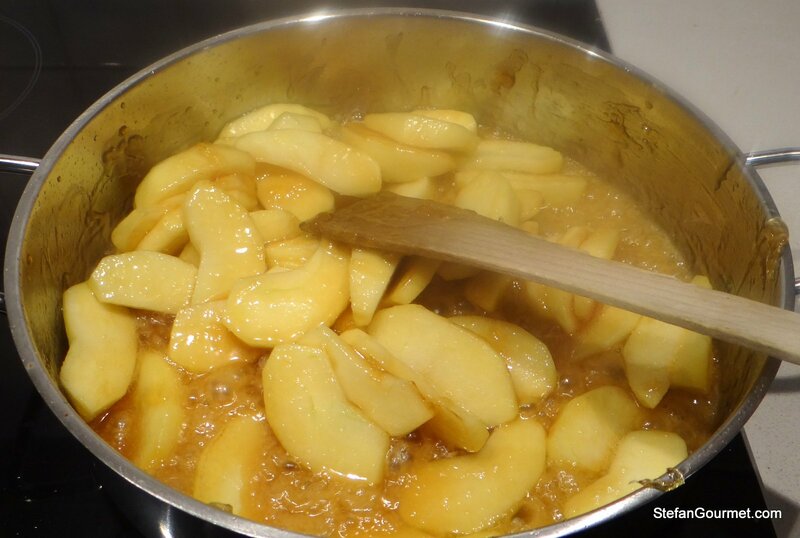 The apples should be slightly soft; cook a bit longer if needed. 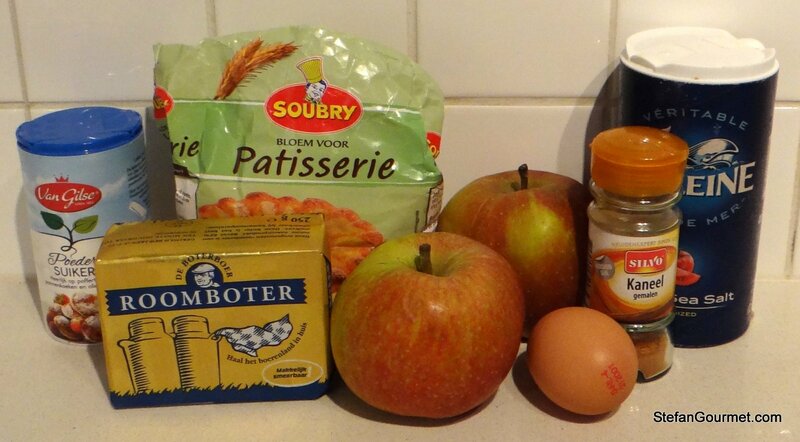 Do not cook too long, otherwise the apples may fall apart. Turn off the heat. 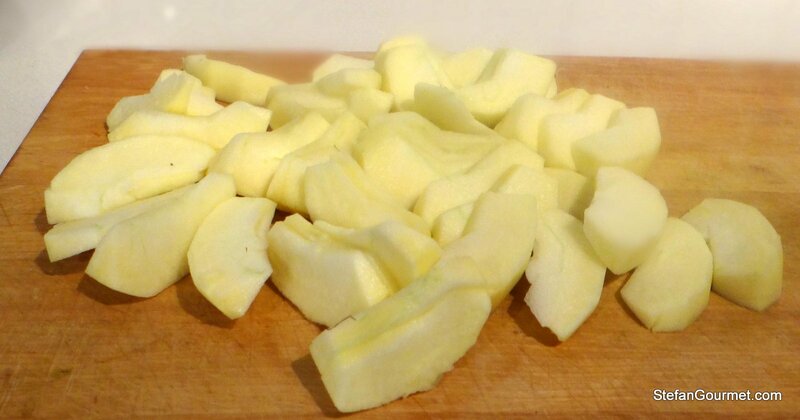 Take the dough out of the refrigerator and try to arrange it in one piece on top of the apples. It is not a major issue if it tears a little. Brush the dough with the remaining beaten egg. 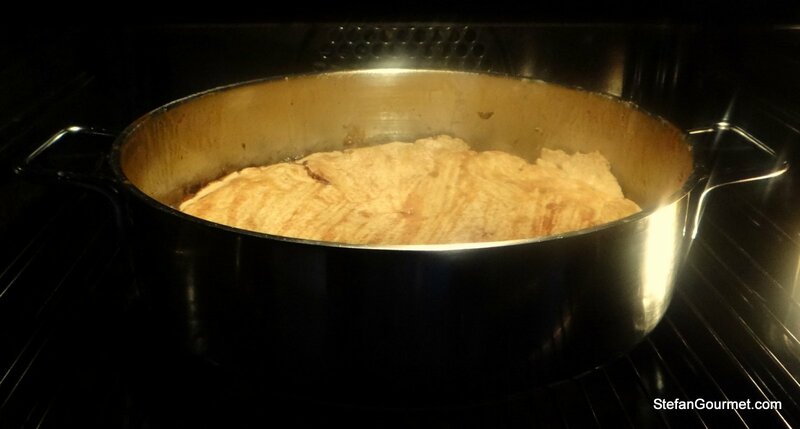 Bake for 30-35 minutes at 200C/390F until the pastry is golden brown. Take the tart out of the oven. 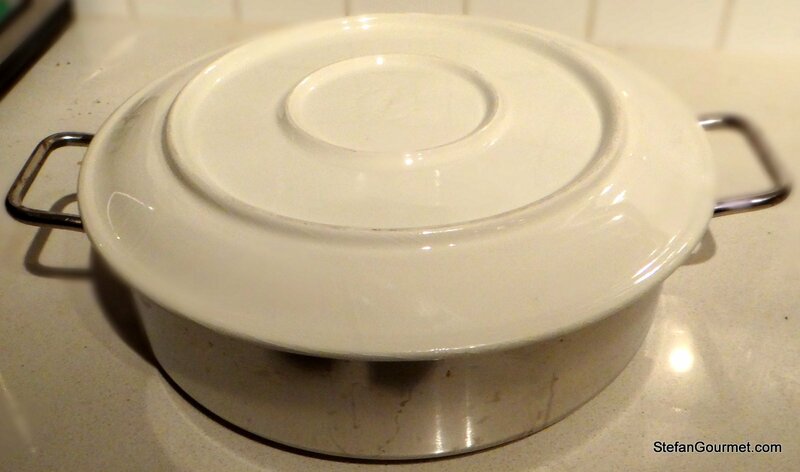 Put a large plate on top of the pan. Turn over the pan and the plate. Be careful because hot caramel may leak. The tart should now fall onto the plate. If this doesn’t happen, you may have to loosen the edge of the pastry with a knife. 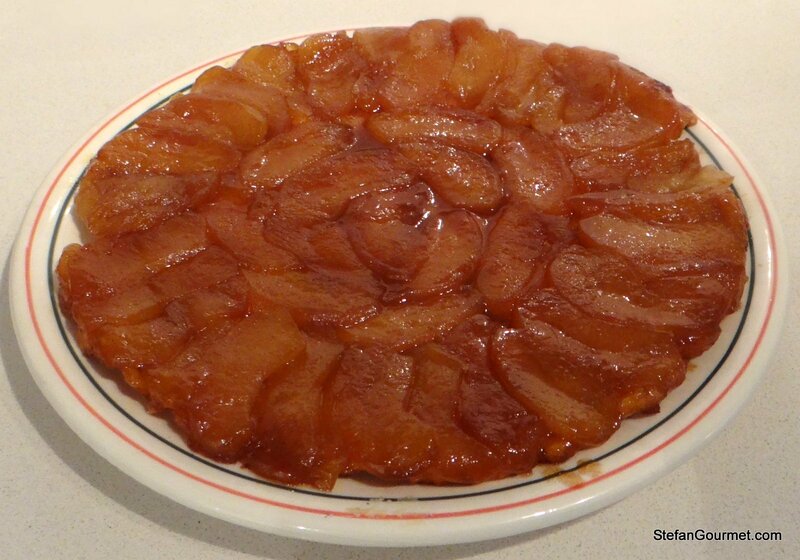 If all went well, you will have a beautiful tarte tatin! You can serve it immediately or allow to cool if you prefer. 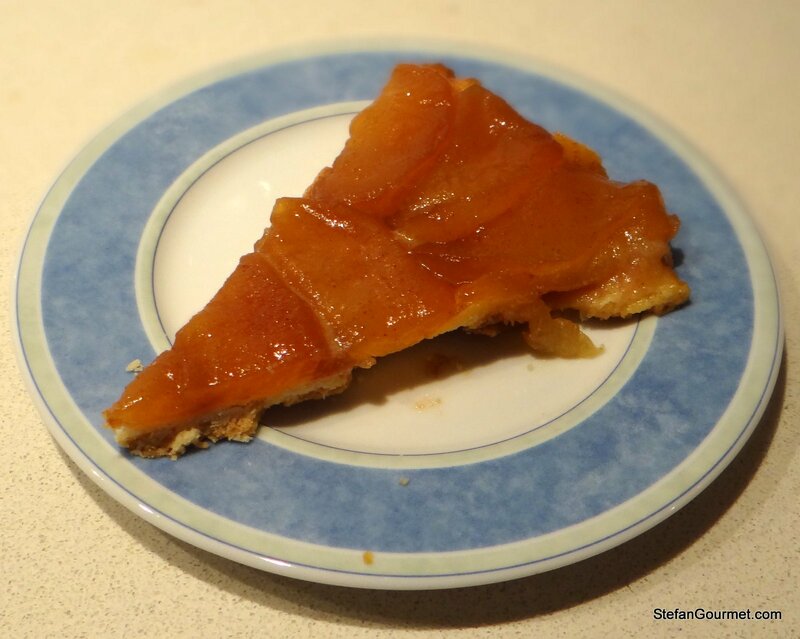 Tarte tatin is great with sauternes, especially one with a lot of sémillon and some oak, as that goes best with the caramel. Wonderful photos which really “walk” the person through the procedure! 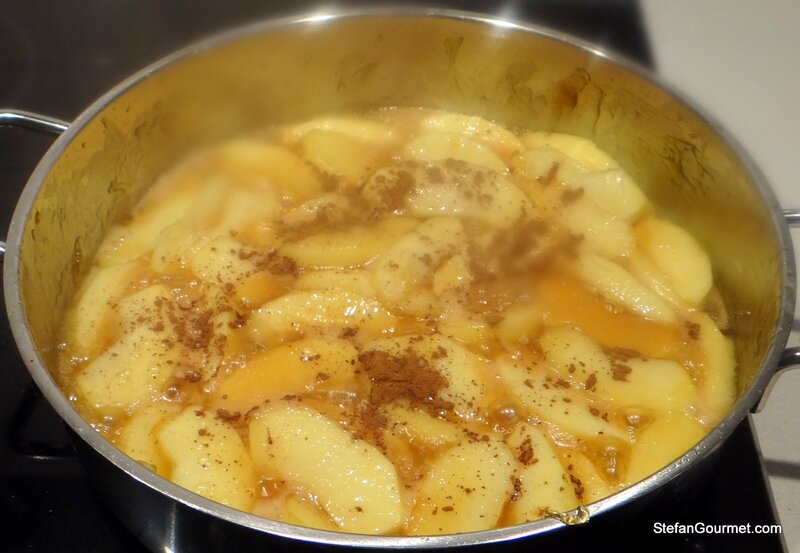 ChgoJohn & I are hoping that the caramel/apple mixture is easier than the caramel both he & I recently tried to make…. and gave up on!! Just keep trying. I didn’t get it right the first time I tried this some years ago. You could always practise with store-bought pastry first. The pastry shouldn’t be too hard for me because I’ve made pastry off & on through the years. It’s the caramel that both ChgoJohn and I had trouble making. I’m gonna let you know if, following your directions, I’m finally able to make caramel. And thanks for your suggestion of using cake flour or pastry flour. What a wonderful tip !! The reason why this caramel is easier, is that it is made of sugar AND water. Making caramel of just sugar is possible, but a lot more difficult. It also affects the fluidity/viscosity of the resulting caramel. In this case a thinnish caramel is okay, because we want the apples to be infused with caramel. Good luck! Again – you simply amaze me !! What a great recipe! 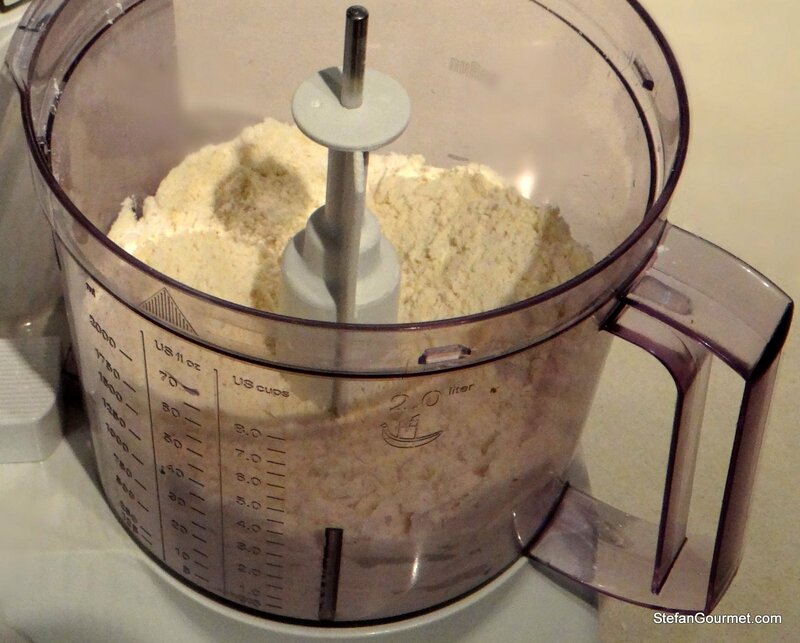 Don’t you love using a food processor to make pastry? The apples look perfectly caramelized and so succulent! 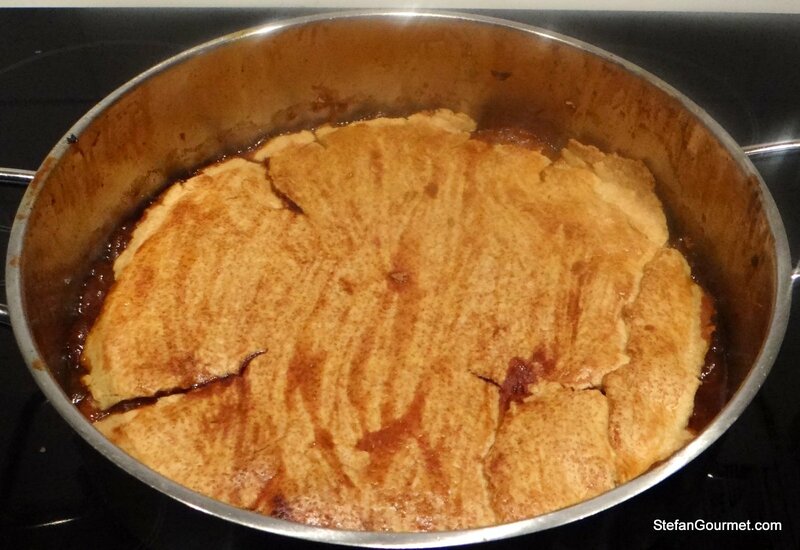 How cool that you baked the tarte tatin in the pot itself and turned it out onto the plate. And the presentation is just beautiful! What variety of firm apple did you choose? This was elstars, but I’ve also used renettes. Making pastry with a food processor or at least with tools is essential, because your (warm) hands would warm up the dough too much. We do not have either apple variety in the States. They look similar to Fuji, a tart, firm and crisp apple. 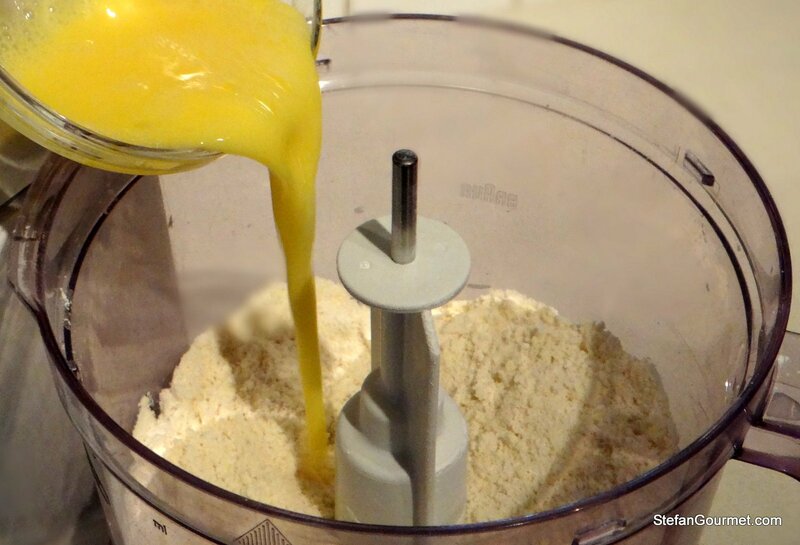 Oh, yes, I see about the value of the food processor in making pastry – especially with warm hands affecting the cold butter. I love using it for a perfect quiche crust! Did you do anything differently? For me it went wrong when I didn’t have enough caramel (or too thick) and it got stuck. i made a couple of technical mistakes, my pie crust didn’t have enough time to relax in the fridge and when I rolled it out, it shrank and never covered the bottom of pie entirely. It flipped and slid right off the pan no problem, but then I tried reshaping the pie so the apples would sit better over the small crust disk.. so i flipped the pie back over onto a soup plate… i dont know if this makes any sense, but in any case, the pie got stuck onto the plate, i had to literally rip it off the plate chunk by chunk… I should have left it alone, it looked pretty, the apples caramelized really nicely. Sounds like your next one will be a success! PS When I use low-gluten flour (pastry flour, cake flour) the relaxing is hardly needed, if at all. I actually find it harder to work the dough after it has been in the fridge too long, ad it will tear when I try to roll it out. thanks!!! yeah, low gluten flour is the way to go. I used normal all purpose flour, and I barely mixed it, and it develop enough gluten to become tough unfriendly. It doesnt happen often, but it happens. The problem with all purpose flour is that it basically means “any flour we had left and couldn’t sell for any other purpose”, so you never know what you’re gonna get. Through your shots and your description everything seems to be so easy to do. I’m sure you can do it, too. Perhaps with a bit of practise? I know I needed it. Very nice Stefan. I know I would have fallen down on the pastry making. 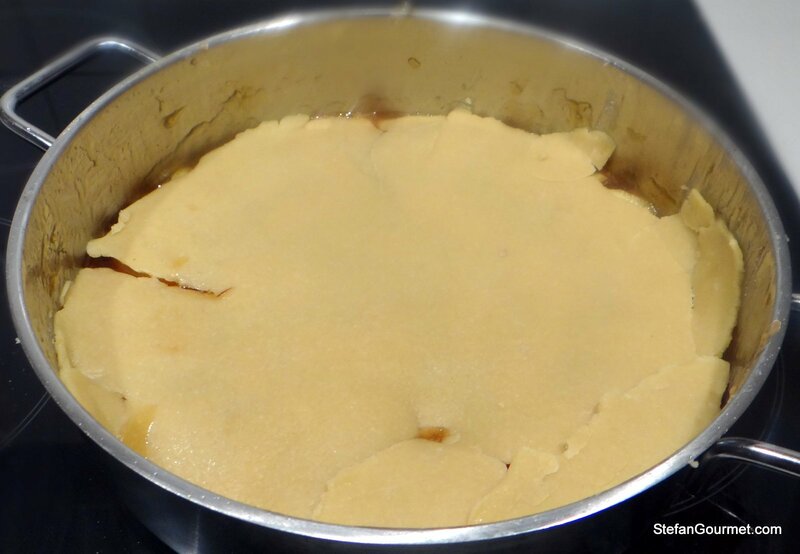 That slurping sound when one inverts the pan is the moment of truth with the tart. Too true. She has the knack. Thanks, John. You are right I was relieved, even though one single piece of apple got stuck (but I managed to transfer it separately and put it in its place). Sorry to hear you burned your fingers — the good thing about this recipe is that the caramel doesn’t need to be very dark so you don’t have to cook it to the ‘blubby’ stage. It is also good to remember never to stir caramel. I re-read this and agree with everyone here that it is a great technique for a great dessert. I use a buttered cast iron skillet to hold the apples, then pour the caramel over them before topping with puff pastry and bake. I think I will try your method next time. This is one of my all time favorite desserts [along with creme brulle, angle food cake, and 100 others 9smile0].